The 350GT was Lamborghini's first production car - way back in March '64. Coachbuilders Touring - of Milan, Italy - were tasked with styling the car. Their work was based on the 350GTV prototype. Touring's bodywork was composed of alloy panels. They were hung on a Superleggera steel frame. The 350GT's light body was key to its top speed of 152mph. The solid round-tube chassis was held up by coil spring and tubular wishbone suspension. Girling disc brakes stopped the plot. Gian Paulo Dallara and Giotto Bizzarini engineered the 350GT. Power was supplied by the trusty Lamborghini V12. The crankshaft of the quad-cam 60° motor was machined from a single billet. Complete with side-draught carburettors - to allow for a low bonnet line - that made for 280bhp. Capacity was 3,464cc. The 5-speed transmission - and steering box - were by ZF. The rear differential was by Salisbury. Fast, smooth and tractable, the 350GT handled well, to boot. Both in terms of form and function, then, that first Lamborghini production run was off to a flyer! Inside, the 350GT was a blend of user-friendly luxury. There was, for example, a synchro-mesh reverse gear. Just 143 350GTs were built. From the start, then, exclusivity was part of the package! 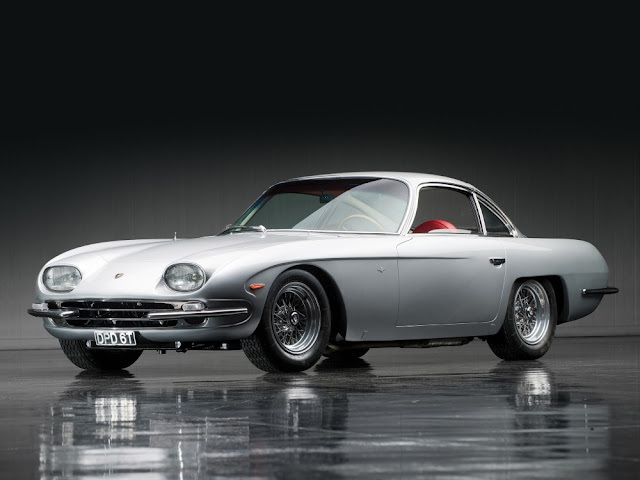 While in many ways different from the Lamborghini supercars of today, that first 350GT had all the allure and panache that were to become so synonymous with the marque.